NACEO | 2014 – Skavarla III, John E.
2014 – Skavarla III, John E.
Gov. 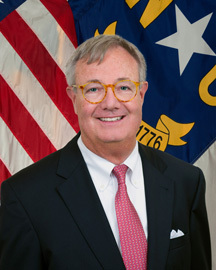 Pat McCrory named Mr. John E. Skvarla, III Secretary of the N.C. Department of Environment and Natural Resources in Dec. 2012, as part of his new Cabinet and administration. Mr. Skvarla comes to DENR after a successful career in business. He most recently served as CEO for Restoration Systems, an environmental mitigation firm based in Raleigh that helps improve and restore wetlands and waterways. His past environmental experience also includes his work as chairman with Wilkinson Hi-Rise, a world leader in manufacturing new products such as waste management and automated recycling systems. Skvarla previously served as chief operating officer for The Aviation Group, Inc., a company that emerged as the world’s largest all-cargo airline during his tenure. He also has been managing director of an investment banking office in Raleigh and owner of a Sandhills golf course community. An attorney, Skvarla in 1978 founded and served as senior partner to the Raleigh-based Skvarla, Wyrick and Robbins law firm, where he specialized in corporate and tax matters, as well as public and private capital formations.